Mustapha while briefing State House correspondents, debunked the impression that the Federal Government was not doing enough for South-East people. 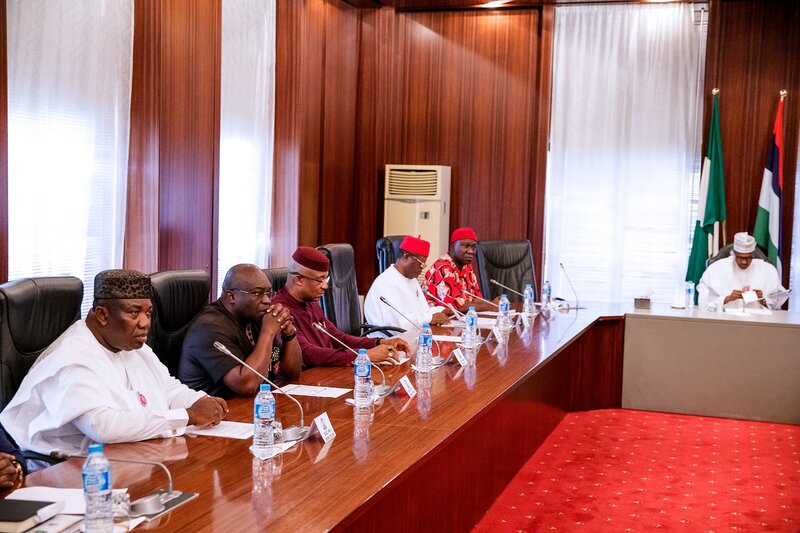 He said: â€œWe received very high-powered delegation today led by the Deputy President of the Senate and three of their governors and a deputy governor, and the Director-General of Forum of South-East governors. â€œI think it is a remarkable visit because they came essentially to thank the president over the major activities that have taken place in the South-East. â€œThey appreciate the fact that the second Niger Bridge was a paper issue in the last five, six decades. â€œThey are convinced that the decision to complete the Niger Bridge is real; contract has been awarded by this government for N206 billion. â€œIt is a mark of appreciation for the leadership that President Muhammadu Buhari is providing for this country. On whether Buhari solicited the votes of the South-East at the meeting, Mustapha said: â€œthis obviously might not be most appropriate time. â€œYou remember there was a programme in the South-East where the president asked me to represent him and I flew the kite by telling the Southeast states that their quickest and easiest means to presidency is to support Buhariâ€™s second term. â€œThis means that they can short-circuit the period in terms of only having him there for another four years. â€œWhatever they do in 2019 will determine what will happen thereafter because politics is a game of numbers and it is like a cooperative society. â€œWhatever you bring as an investment when dividends are going to be shared, you will get proportionate with your investment and your investment in politics is what you bring to the table. â€œI urge the Southeast to look at this matter seriously that every time we have a presidency in Nigeria, it is negotiated in several ways. â€œIt is either negotiated by votes or what you bring to the table and you must negotiate from the position of strength. You canâ€™t negotiate from the point of weaknessâ€.